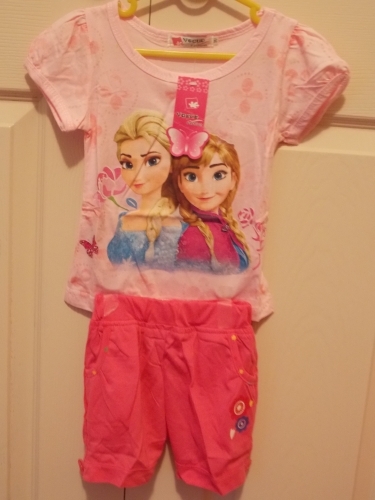 Frozen t-shirt and shorts set with Anna & Elsa picture available in various sizes. Please make selection. Material is cotton. Size 90cm/2yrs: Shorts measure approx 19cm waist stretching out to approx. 25cm with length from waist to hem approx 24cm. T-Shirt measurements across chest from underarm are approx. 26cm and length from nape of neck to hem is approx. 34cm. Size 100cm/3yrs: Shorts measure approx. 19cm waist stretching out to approx. 26cm with length from waist to hem approx. 26cm. T-Shirt measurements across chest from underarm are approx. 27cm and length from nape of neck to hem is approx. 36cm. Size 110cm/4yrs: Shorts measure approx. 19cm waist stretching out to approx. 27cm with length from waist to hem approx. 28cm. T-Shirt measurements across chest from underarm are approx. 29cm and length from nape of neck to hem is approx. 37cm. Size 120cm/5yrs: Shorts measure approx. 20cm waist stretching out to approx. 29cm with length from waist to hem approx. 29cm. T-Shirt measurements across chest from underarm are approx. 30cm and length from nape of neck to hem is approx. 40cm. Size 130cm/6yrs: Shorts measure approx. 20cm waist stretching out to approx. 30cm with length from waist to hem approx. 30cm. T-Shirt measurements across chest from underarm are approx. 30.5cm and length from nape of neck to hem is approx. 41.5cm. Sale Price: $9.97 You Save: $9.98 (50%)!